The B2 Stealth bomber flying over the ocean in Zukor's Air feedback game. OXNARD, Calilf. - The announcement last month that Aaron Hernandez had chronic tramatic encephalopathy (CTE) when he commited suicide while in prison did not come as surprise to many former NFL players. That's because they suspect they have the degenerative brain disease diagnosed too. Former Kansas City CHiefs running back Larry Johnson said on Twitter he's "certain" he has CTE, which has diagnosed posthomously in 111 former NFL players. Hall of Fame receiver Cris Carter said he lives in "fear of the unknown". Husain Abdullah, who retired at age 30 last uear after sustaining his fifth concussion told USA TODAY Sports former player know "things can get bad and get bad in a hurry,"
Worst of all for these players and other athletes is there is no reliable wayto test for CTE in the living. And there is also no treatment for anybody with symptoms of disease. However, several former NFL, colege and high school football players and other athletes say they are finding sucess at a recovery center in Southern California that claims to helo rehabilitate brains suffering from the effects of repeated and severe trauma. "I didn't tink it was something that could be fixed," Jermichaek Finley told USA TODAY Sports. He retired from the Green Bay Packers in 2015 after he says he sustained five concussions in his football career. "I noticed irritability began to set in and really didn't know that to do. When I heard about the place, my first thought was, 'Man, this is not my kind of deal.' I was told to think outside the box and see what's going on with my brain"
Pure Recovery California Center, located in this beacg town about 60 miles north of Los Angeles, was founded in 2014 by Deborah Whitney, a former executive for health care companies that developed and sold medical devices. According to Whitney, the clicnic has treated two active NFL Players, 12 former NFL players and six current college football players in 2017. The current NFL Players sougth treatment on their own, either as free agents or whie they were suspended. Citing patient privacy laws, Whitney said she's unable to provide the names of the players without consent. "I think this is going to be huge," Finley said after six weeks of treatment. Whitney said the athletes who have come to the facility have shown tha teltale sighs of brain injury: impulsive behavior, deoression, suicidal thoughts, irritability, sleeo disorders and short-term memory loss. Those are also the symptoms associated with the reary stages of CTE, Somthing Boston University's CTE Center - the same outfit that diagnosed CTE in Hernandez and 110 other former NFL players - reported last month could soon be diagnosed in living patients through blood testing.
" What struck me in that they had some many things wrong with them related to their brains,"Whitney said." I didn't understand why all these people, who we al enjoyed watching when they were players, weren't getting the support many so desperately needed. That's when I started to reach out to the top experts in the field to see what was medically available." Treatment at Pure Recovery begins with a quantitative electroencephalogram (qEEG), which measures electrical activity in the brain. The results are compared to those taken from people of the same age and gender and then used to generate a three-dimensional map of the brain that highlights areas that my not be functionong normally. Pure Recovery inconrporates pulsed magnetic field stumulation (PMFS), a non-invasive technique where magnetic fields are used to help spur the brain's electrical activity. While not utilzed as much as PMFS, the clinica can use pulse electrical stimulation, in which small electrical currents stimulate nerve cells within targeted areas of the brain, That Theraoy is derived from the controversial eletroshock therapy. "It's not One Flew Over the Cuckoo's Nest." said Harry Kerasidis, a neurologist who has helo develop Pure Recovery's program. "We have a come a long way since then. One of he nice things about stimulation therapy is that it does not take a lot of energy. You don't have to induce a shock that evenresults in a twitch and definitely not convulsions." Finley's initial qEEG test showed that 44% of his brain was dysfuntional. That number improved by 33% after 10 sessions that included playing games aimed at increasing brain activity and neuroplasticity, the brain's ability to form new neural connections and recover from injury. After 30 sessions over six weeks, Finley's brain was measured at 20% dysfunction. They showed me where my brain was and that it could have led to my impulsivity," Finley said. "Things began to change. Things started to slow down." Pure Recovery's therapies have been successful in patients with attention-deficit/hyperactivity disorder (ADHD) and Parkinson's Disease, and in stroke recovry. However, concussion recovery - and potentially counteracting CTE - is a new use of techniques. Kerasidis said the treatments are limited. A patient whose brain has ben inundated with the proteins that scuttle brain function would exprerience less improvement. "it'd be like when you have a person with autism," Lerasidis said. You can do things to helod address symptoms, but that person will always have autism." Because it's new approach, no research has been published and there is limited understanding of long-term effectiveness. But two neurilogical researchers and an NFL team neurologist not affiliated with Pure Recovery told USA TODAY Sports that such treatments could prove fruitful. Gerwi Schalk, deputy director of the National Center for Adaptive Neurotechnologies, and Moshe Bar, director of Gonda Multidisciplinary Brain Research Center in Israel, said they believe Pure Recovery has struck on the right approach. "I do believe (the treatments) can aid the body's response, neuroplasticity," Bar said. 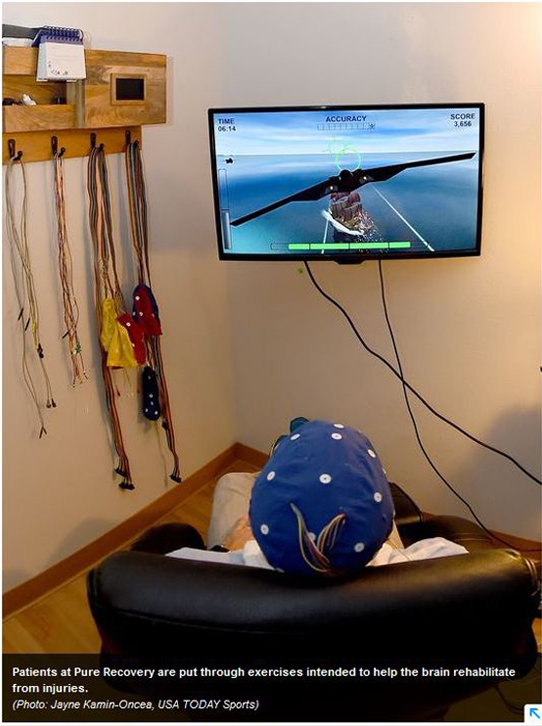 "I'm optimistic neurofeedback can have some benefits." "My goal was to see what's goin on," said Maroon, who visited the Pure Recovery on his own accord and not as a representative for the Steelers or the NFL. "They are really doing something good from a scientific basis. It's pricipal of rehabilitaion now for strokes. Biochemical changes can occure in the brain using mind to remake, remodel or restructure brain." "You get to see your brai and see feedback from certain part of your brain not functioning that is causing you to feel down and depressed." said Abdullah, who is consultant for Pure Recovery and has been in contact with former players. "It took me out of a fog in a couple sessions." Abdullah and Finley took part of a 30 day program, which also includes meditation, organic diet, speech therapy and exercise. The main office is located aling the Pacific Ocean and the compay has two rented two sizanle houses nearby for athletes to stay, often with their families who are encouraged to be part of the process. Abduullah sai that approach gives something that many former players lack once theor careers are over structure. "When you;re a guy with $5 milion in your back account and you remove his identity as a football player - one he's had since he was a kid - he no longer can thing of himself as an athletes," Abdullah said. "You also eliminate the structure he's had along with his support system. There's the blood family and then there's football family. Now, the football family is gone. You mux that in with the mental health issues like depression and anxiety that may have been the result o concussions, it can lead to a lot of issues. That's whay so many of these guys go broke. You basically need a program like this to re-craft a player after retirement." A 30-day program doesn't come cheap. It runs about $58,000, although insurance - especially for the current and recently retired NFL players - often covers a bulk of the tab, Whitney said. THe treatment could spread beyond Pure Recover and give hundreds of football players hope for thei future. "I wish those players would kneel in protest that there's not enough being done to treat concussion effects for their football brothers who are suffering," Finley said.